Movie: "I Don't Feel at Home in This World Anymore"
After a bad day at work, a nurse named Ruth (Melanie Lynskey) comes home to find her house has been robbed. When she feels like the police aren't providing with proper help, she decides to take matters into her own hands and teams up with her oddball neighbor Tony (Elijah Wood) to investigate the theft. "I Don't Feel at Home in This World Anymore" is written and directed by Macon Blair. It is his directorial debut, but many may know him from his appearances in the Jeremy Saulnier films "Murder Party," "Blue Ruin," and "Green Room." This film stars Melanie Lynskey as a nurse named Ruth, who is fed up with how the world is constantly being populated with people who are assholes to each other. When her house is broken into, her laptop and her grandmother's antique silver are stolen, so she calls the police. When they prove to be no help, she takes matters into her own hands with the assistance of her obnoxious neighbor Tony, played by Elijah Wood. At first, they don't really know what they are doing, but as their investigation progresses, they start putting themselves into increasingly more dangerous situations. "I Don't Feel at Home in This World Anymore" may have an absurdly long title, but beyond this, it is a darkly humorous, offbeat, gritty revenge thriller. Elijah Wood is fantastic as Tony, who is a bit weird and is kind of a loner. He is really into martial arts, regularly carries around nunchucks and ninja stars, and sports aviator sunglasses and a horrible braided rat tail in his hair. His character is slightly bizarre, but has many funny moments that Wood is able to pull off extremely well because of his background playing oddball character like this. The real star of the show is Melanie Lynskey, who is magnificent as a timid person who starts to break out of her shell, becoming more bold as the film progresses. It's a role Lynskey seems born to play. She and Wood have tremendous chemistry as partners in crime, and their individual quirks only add to the weirdness of the situations they encounter. Along with good acting, there are loads of cool and gory visuals that come later in the film as limbs get blown off and as people wind up dead. This is often done in a bumbling comedic manner as slapstick is taken to the nth degree, but we never mind at all because it's so unpredictable and hilarious. It is wonderful to see Macon Blair branching off and doing directing on his own, and we couldn't be more thrilled with his success. We have at the very least really liked all of his films with Saulnier, and "Green Room" even made our 2016 best of the best list. 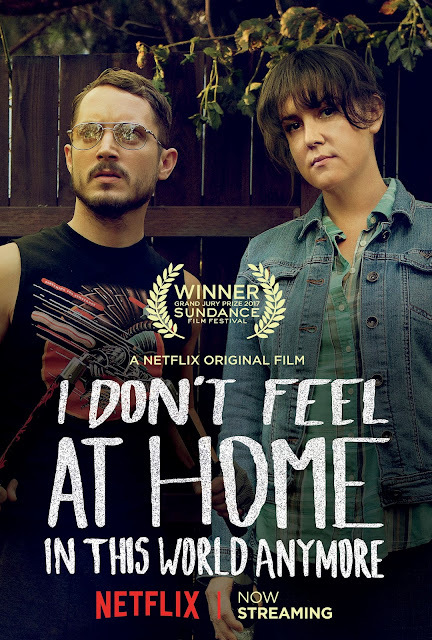 Blair manages to do a lot here with a low budget, making a fun, bloody, truthful and horrific movie that can make you laugh in "I Don't Feel at Home in This World Anymore." We hope to see more directorial efforts from him in the future because he has a compelling eye for storytelling and has a lot to say about our society. Thank God Netflix picked up this Sundance winning project because it is awesome!